Anyone passing through the village of Hook Norton cannot fail to notice the distinctive and charming ‘just add it on where we feel we need it’ Grade 2-listed tower brewery designed by William Bradford, the prolific Victorian architect of breweries. A lucky passer-by might also catch sight of the Shire horse-drawn dray travelling the leafy lanes making beer deliveries to local pubs. 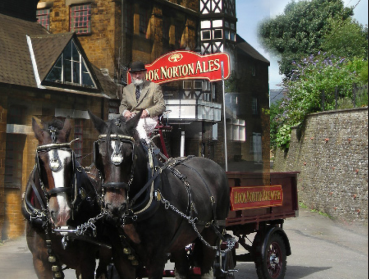 Sitting comfortably alongside these traditional ways, Hook Norton Brewery (HNB) also shows its modern, entrepreneurial spirit. Managing Director & Head Brewer James Clarke and his team make a range of award-winning beers and ales using spring water from the wells 200 feet beneath the Brewery - beers which, in 2017, have made their remarkable journey to success on the international stage. These more modern distinctions (HNB was also one of the first breweries to opt – successfully! - for SALSA plus Beer certification) and their most recent honours at the World Beer Awards (London, August 2017) have given the Brewery plenty to celebrate. Top honours went to Red Rye, a ruby red, fruity ale which picked up both the UK’s Best Rye Beer and the World’s Best Rye Beer, repeating its success from 2015. Further honours came with their new baby (just six months old) Playing Hooky which gained a UK Pale Ale Bronze. Old Hooky, 40 years young, was voted the UK’s Best English Brown Ale showing there is still a place at one’s elbow for a full-bodied, classic real ale. Hook Norton’s core beers are available in bottles direct from the brewery. Beer is also supplied to an extensive network of local pubs and restaurants, and is stocked, among others, by Majestic, Sainsbury’s, Waitrose and Ocado. Brewery and Museum visits and tours are open to visitors who can ‘try before they buy’ from the year-round range, seasonal and specials. The Shop also sells English wines. STOP PRESS! Due to open December 2017 - the new Malthouse Kitchen Restaurant – Christmas, New Year and party bookings now being taken!